Welcome to the Trinity Trainer Pool website. The pool is run by the Trinity Trainer Pool Association, a registered charity, and relies on the support of the volunteers who sit on the committee. It is located half a mile from the town centre. The pool is a valuable resource, providing a welcoming and safe environment for the children of Henley-on-Thames and the surrounding area to develop confidence in the water and to learn to swim. Thousands of children have benefited over the years and some of them are now bringing their own children.The pool is warm and shallow, making it ideal for babies and school children. 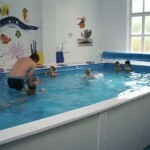 We offer group swimming lessons, school sessions, private hire and a venue for children’s parties. 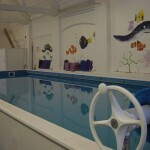 The pool is available for hire by schools and is currently used by several primary schools in the town. Schools must provide their own qualified swimming teacher and follow the pool operating procedures. Families can hire the pool for one hour at a time on Saturday afternoons and all day on Sunday. We are pleased to provide an online booking system and the option to pay online via PayPal. Group lessons are provided by two qualified and experienced swimming teachers, catering for babies, toddlers, pre-schoolers and children at primary school. The pool can be booked for parties. The maximum number of people in the pool at one time is 16. Please contact the committee for more details.